Lagoon-style pool meanders through palm gardens, surprising the kids with waterfalls, a splash zone and more. The fully equipped gym lacks nothing. Plenty of extra places to gather for a game or sip drinks. You're two minutes away from the Indian Bayou Golf & Country Club. The Emerald Coast Center shopping plaza is right next door. A gentle breeze blows through the palm gardens that surround the lagoon-style pool. Designed to impress, it’s the largest in Destin and the favorite of many. 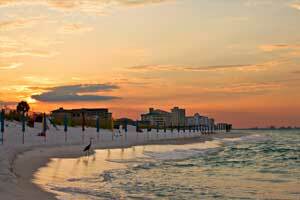 The Palms of Destin has a bright, modern feel with its sparkling white high rise towers. The sprawling zero-entry lagoon pool is home to five dancing waterfalls, a children’s splash zone, and a hot tub. If you’re into tennis, bring your racquet for lessons and clinics with USPTA and USPTR pros, and as many games as you can squeeze in on the resort’s two lighted courts. If basketball is more your thing, get in touch with your inner-Michael Jordan on the basketball courts. Or hit the state-of-the-art fitness center with top-of-the-line cardio equipment. Treat yourself to a well-deserved Swedish massage at the on-site Spa. Little ones will have a blast on the children’s playground. Luxurious junior two-bedroom and two-bedroom condos sleep six guests, are air-conditioned and have all of the comforts of home. Full kitchens with granite countertops and breakfast bars give you the freedom to make your own meals. The resort is a short walk to both Walmart and the Destin Euro Market for groceries. Bring the family along to make sure that no one’s favorites are forgotten. Flat screen TVs have premium cable and DVD players, perfect for catching a sitcom rerun or for family movie night. Pack movies from home, gather the family on the couch and pop some popcorn. Two-bedroom condos offer more space and an in-suite washer/dryer so you can pack light and keep the whole crew looking good. Surprise the kids with a field trip to Big Kahuna’s Water and Adventure Park or The Track. Big Kahuna’s Water and Adventure Park features over forty rides and attractions including pools, slides and water play areas. The Track is a family recreation center that offers mini golf, go-karts, an arcade, and rides. Go-kart rides include Kiddie Karts, Family Track, and Wild Woody. Kiddie Karts are for little ones between three-foot-six and four-foot-two. It’s safe enough for even the youngest kids to experience. The Family Track includes single and double karts that ride on a traditional figure-eight track. Wild Woody is on an elevated, multi-level track. Jungle Jumper, Red Baron Planes and the swings will be a big hit with the little ones. Shopaholics will love Destin Commons. It features a variety of shopping and dining options. Stores include Foot Locker, Brookstone, Build a Bear and Williams Sonoma. When you get hungry, there’s Johnny Rockets, Uncle Buck’s Fishbowl & Grill and Panera Bread. Don’t forget a visit to Starbucks for a frappuccino or iced tea. - Front Desk is open Tuesday-Saturday 8:00 AM - 6:00 PM and Sunday-Monday 8:00 AM - 4:00 PM. Guests who arrive outside normal front desk hours can pick up keys to the unit from a lock box located by the front desk.